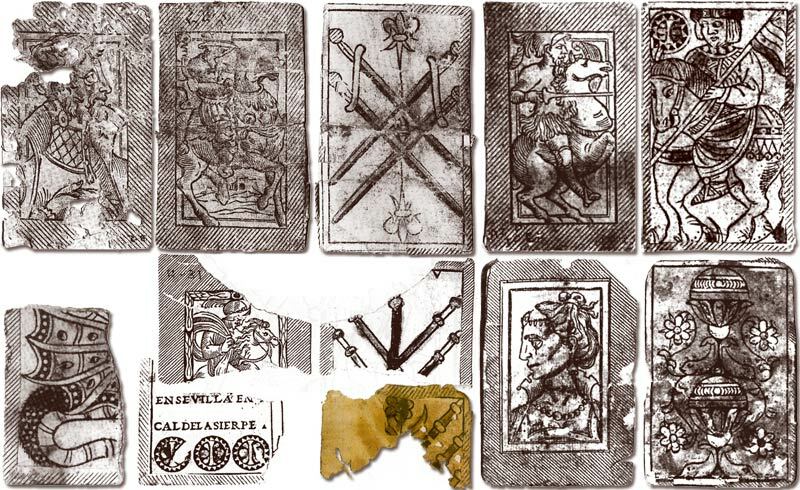 33 fragments of playing cards and 2 dice were unearthed in a 16th century rubbish tip adjacent to a Spanish house in the lower Rimac Valley in Peru, providing evidence of games played by early Spanish settlers. In amongst the rubbish associated with the cards there was also a paper document dated 1516. The cards are from more than one pack, and fall into two groups. The first group comprises cards of the archaic Spanish-suited "Dragon" type of pack, whilst the remaining cards are of a different early Spanish-suited pattern. Together these cards provide stunning evidence of early Spanish playing card production exported to Central and South American countries very soon after the 'discovery' of the New World. This pattern has long been extinct. A fine example is preserved in the Archivo de Indias in Seville manufactured by Francisco Flores, along with a sheet of similar allegorical back designs with Mexican imagery, and the contract for one Alonso Martínez de Orteguilla to administer the manufacture and sale of playing cards in New Mexico in 1583 (see mock-up of four cards shown below). The deduction which might be made is that cards like these were being manufactured in Spain and exported into the newly colonised 'New Spain' since some time in the 16th century, possibly as early as 1516.